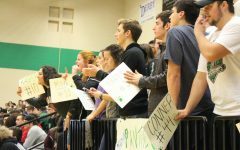 Even before the Panther Pals basketball game had started, the bleachers were filled with students — not just from Derby High, but from elementary schools too. It’s always loud with that many students, but this was a special game. Derby social studies teacher Jimmy Adams introduced the starting lineup for both teams listing the players not with their grades and heights, but instead with their strengths. I really liked this because most of us don’t know most of the players personally, but Adams made us feel like we did. The game began with Northwest in the lead, but no matter which team scored — the Derby Panther Pals or the Wichita Northwest Bear Buddies — students screamed in support. With every shot, you would hear the crowd go ‘ah’ or ‘woo’ in unison, which according to freshman Rebecca Kooser, sounded just like an automated sound machine. Northwest continued to lead at half-time. The Panther Pal cheerleaders were announced just like the starting lineup — with flair. The best part of the performance was when sophomore Chelsea Bell was lifted up and the entire gym was filled with cheers even louder than before. Team A — Sophomores Dylan Gray (4), Mia Ramirez (11) and Jeshua Foss (20), junior Austin Drake (30) and Kyle Etheridge (32) and seniors Hunter Davis (22), Chonice DeMoss (41) and Conner McGee (44), and Dtec. Jerry Harrison (55). Team B — Freshmen Tyler Valentine (15), Dakotah Valentine (42) and Kasper Kirk (10), sophomores Billie Thurman (3), Bryan Vazquez Lopez (5), Guiles Martin-Nesbitt (21) and Caleb Berry (43), junior Ethan Haberman (40), and Dtec. Dakotah Hallum (33), Precious Rose (50) and Tyawn Jackson (53). Panther pals teachers are Charles Gladfelter, Jen Nulik and Karen Bainter. The head coach is Larry Thomas. He is helped by Cindy Eichman and seniors Katy Yell, Hunter Igo and Madi Young, juniors Connor Robinette and Jaici Stanley and sophomore Ashlynn Hicks. Cheerleading coaches are paras Regan Williams and Amanda Ice and sophomores Abby Alderson and Emma Palmer and juniors Karlee Olmstead and Alyssa Haney.